Pennsylvania Traditions Oak Quarter Round is used to accent the transitions from baseboard to floor surface, especially in retrofitted floors where the baseboard is typically not removed. The quarter round provides a subtle blend between the gap in the floor and the wall. Coordinates with laminate flooring providing a beautiful finished look. Buy online Zamma Pennsylvania Traditions Oak 5/8 in. Thick x 3/4 in. Wide x 94 in. 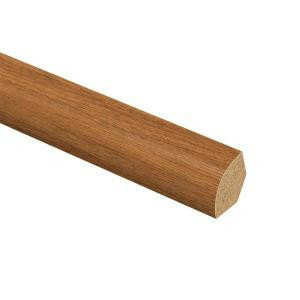 Length Laminate Quarter Round Molding 013141646, leave review and share Your friends.